For the first time since its highly successful production of “The Lion King” in 2009, the ASCC Fine Arts Department mounted a major theatrical production, “Joseph & The Amazing Technicolor Dreamcoat,” which was performed on Wednesday, April 29th and Thursday, April 30th in the Lee Auditorium. With the student cast having been in rehearsal for the duration of the spring 2015 semester, “Joseph” offered a lively evening of drama, dance and music s for family members of all ages. 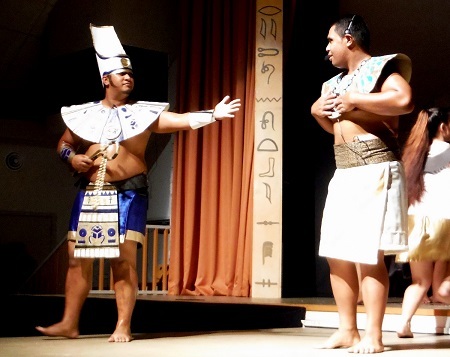 “The play is based on the biblical story of Jacob, his favorite son Joseph and his 11 brothers,” said Music instructor and Fine Arts chairman Mr. Kuki Tuiasosopo. “The play is not a serious drama, but rather a comedy. However, the message of the story remains the same as in the scriptures. The entire play is driven by music composed Andrew Lloyd Webber, with lyrics by Tim Rice, and has absolutely no spoken dialogue.” Notable in the composition of the music is the variety of styles used by Lloyd Webber including French ballads, rock and roll, country, Charleston, Calypso and more. As with previous ASCC Fine Arts stage productions, “Joseph” was an artistic collaboration between its individual faculty. Mr. Tuiasosopo took the role of director, putting the student cast through its paces as they fine tuned the staging of the play. Visual Arts facilitator Ms. Regina Meredith and her students created the appropriate backgrounds for the production, Mr. Tuiasosopo’s fellow Music instructor Mr. Poe Mageo worked with the chorus on their singing parts. In addition, the ASCC Orchestra, under the direction of Mr. Mageo, entertained the audience during the play’s intermission. Mr. Tuiasosopo explained that a number of factors accounted for “Joseph” being the first ASCC stage production since “The Lion King.” “Our department has had some faculty move on and others join,” he said, “so in the interim we’ve basically been focusing on other aspects of the Fine Arts. This semester we felt we had the necessary components in place to revisit a stage production. A play requires a substantial commitment of time and attention from both the faculty and the students involved, plus staging it off-campus adds another layer of complexity, but we think the public found the end results well worth all the effort.” He added that the pending completion of the College’s Multi-Purpose Center, which will include a performance space appropriate for theatrical productions, bodes well for future ventures in this area. The main student cast included Hertha Aumoeualogo Lutu, Warren King, F.D. Seiuli, Mathew Choi, George Mose, Jermaine Tuiasosopo, Keith Metuli, Quenton Burgess, Edmund Manoa, Jocco Asotau, Pale Lefiti, Al Leafa, Lelei Tago, Ilena Williams, Lama Vaisagote, Anneliese Haleck, Lottie Haleck, Mona Iakopo, Etenauga Voight, Tisa Migi, Anna Sewell, Iloa Tavui, Jeeyon Cho, Alton Faasala, Harota Auvaa, Rosanna Faagata, Josephine Tupuola and Iosia Pati.